The Town Hall Committee advocates for sustainable planning and development in Cobourg. It has made numerous presentations to the Town of Cobourg Council regarding the recently amended Official Plan. It addresses issues of concern regarding sustainable planning and development with the Town as they arise. The Bicycle Action Committee serves to improve the bicycling culture in Cobourg by advocating for new bike lanes and routes, improved safety and convenience for cyclists, and bicycle tourism. The Committee developed a Bicycle Action Plan which it presented to the councils of Cobourg and Northumberland County. The Food Action Committee encourages AWARENESS of where our food comes from, how it’s grown, when it was harvested and how it’s processed. We promote ACCESSIBILITY to affordable, local food and information about nutrition and local food programs. We provide CONNECTIONS to useful information and advocate for a sustainable food FUTURE. The Eco Action Committee supports any action intended to have a positive impact on the environment. This includes: promoting the ‘Three R’s” of the waste hierarchy – Reduce, Reuse, and Recycle; providing connections and information on environmentally-friendly or sustainable policies that protect our ecosystems, and; preventing soil, air, and water pollution in our community. So, are you interested in making a difference? 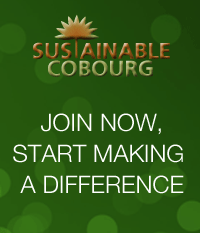 Why not join Sustainable Cobourg and be part of something new, something green?